(PhysOrg.com) -- Diamonds may be best known as a symbol of long-lasting love. 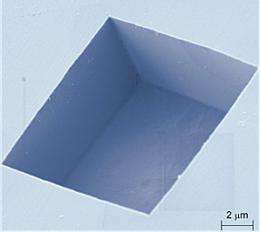 But semiconductor makers are also hoping they'll pan out as key components of long-lasting micromachines if a new method developed at the National Institute of Standards and Technology (NIST) for carving these tough, capable crystals proves its worth. The method offers a precise way to engineer microscopic cuts in a diamond surface, yielding potential benefits in both measurement and technological fields. By combining their own observations with background gleaned from materials science, NIST semiconductor researchers have found a way to create unique features in diamondpotentially leading to improvements in nanometrology in short order, as it has allowed the team to make holes of precise shape in one of the hardest known substances. But beyond the creation of virtually indestructible nanorulers, the method could one day lead to the improvement of a class of electronic devices useful in cell phones, gyroscopes and medical implants. Well known for making the hugely complex electronic microchips that run our laptops, the semiconductor industry has expanded its portfolio by fabricating tiny devices with moving parts. Constructed with substantially the same techniques as the electronic chips, these micro-electromechanical systems, or MEMS, are just a few micrometers in size. They can detect environmental changes such as heat, pressure and acceleration, potentially enabling them to form the basis of tiny sensors and actuators for a host of new devices. But designers must take care that tiny moving parts do not grind to a disastrous halt. One way to make the sliding parts last longer without breaking down is to make them from a tougher material than silicon. The method uses a chemical etching process to create cavities in the diamond surface. The cubic shape of a diamond crystal can be sliced in several waysa fact jewelers take advantage of when creating facets on gemstones. The speed of the etching process depends on the orientation of the slice, occurring at a far slower rate in the direction of the cubes facesthink of chopping the cube into smaller cubesand these face planes can be used as a sort of boundary where etching can be made to stop when desired. In their initial experiments, the team created cavities ranging in width from 1 to 72 micrometers, each with smooth vertical sidewalls and a flat bottom. From the picture up there, based on the scale and consistency, this technique could easily be scaled down to a feature size of 100 nm or lower. Smallest wii controller ever(motion detecting gyroscope). Consider if you made a diamond microchip with sensors built directly into it using this technique. You could have an amazingly accurate, high speed, and durable sensor, whether it be for fiber optic transmission, or ion engine optimization.